It’s one goal down but another lurking for the Picton Pirates. Picton secured home ice advantage in the first round of the Provincial Junior Hockey League playoffs by virtue of thumping the visiting Amherstview Jets 8-3 at home on Thursday and then, with precious little to play for, Picton went into Port Hope and doubled up on a desperate Panthers squad 4-2. All the way around, this young Picton squad is feeling their oats and starting to perform equal to or greater than its promise. And it’s that realization that has Pirates head coach Tyler Green enthused for the tests the club will face over the final ten days of the regular season and what lies in wait afterwards. Thursday night’s win was a bit uprising as Picton exerted its will in the latter stages of the contest and seemed to take the visitors out of the game with each goal they scored. “(Thursday’s blowout) was somewhat unexpected given the fact we had some tight matches against them this season but it seemed like we did a great job getting traffic to the front of the net and delivering the point shots. We definitely had some bounces that went our way,” Green said. Picton started well and potted the first pair of goals with Devin Morrison and Jack Dow lighting the lamp in the first half of the period. But Amherstview responded with a pair including a powerplay tally by Wyatt Crampton to even the score at 2-2. Then, one of Picton’s most emergent players and a skater who personifies the evaluation of the hockey team struck in the closing seconds of the frame. Landon McLellan’s first of three on the night wasn’t anything overly spectacular but the timing was perfect as he stuffed the puck into the Jets net off a Matt Scott feed with just 11 seconds left in the stanza. All told, the Shannonville native potted three in the win over the Jets and sniped a shorthanded goal against the Panthers while setting up an insurance goal in the third period of Saturday night’s game. McLellan opened and closed the scoring in the second with goals from Cooper Rogers and Morrison sandwiched in between. A Derek Vos powerplay effort in the opening minute of the third made the spread 8-2. The Jets Carter Clarke would bang home a loose puck at 2:31 of the third but that was as close as Amherstview would get on Thursday night and with the loss the Jets, who had claimed at least a third place finish, were assured of staying there for the rest of the 2018-19 season. On Saturday and not much to play for, Picton travelled to Port Hope to visit the Panthers who are locked in struggle with the hard charging Gananoque Islanders. The Cats find themselves up two points on the Isles for the final Tod Division playoff spot with each team having three games left on their schedule. Despite the lack of an obvious motivation, Picton was quicker to the puck in the first frame. Tristan Cowan opened the scoring early for Picton with his fourth of the season just 56 seconds in. Later in the period, Will Harrison sent in a streaking McLellan for his 25th overall and fourth shorthanded goal of the campaign. Port Hope would respond in the second Bryson Kelloway would beat Picton starter Brennan Bush at the 7:07 mark to make it 2-1. The game was tied in the late going as Corey Saman scored with 18 seconds left on the clock and Picton needed to do some soul searching in the second intermission of a suddenly brand new hockey game. Port Hope challenged us and came back quick in the second but I really liked the way our team regrouped and responded. That game really showed the character of the team,” Green added. Naturally, it was a leader who led the way to the Port Hope net as Morrison scored his 19th of the season on the powerplay 3:43 of the third. On the next shift and Picton still buzzing, it was the aforementioned McLellan setting up Dow for a clutch insurance marker and making the final score 4-2. Bush made 16 stops for his team leading 14th win of the season. “Bush played really well and we were really happy with his performance,” Green said. With the emergence of Kyle Renaud who posted the win on Thursday in a 22 save effort, Bush has been tasked with a somewhat reduced workload. 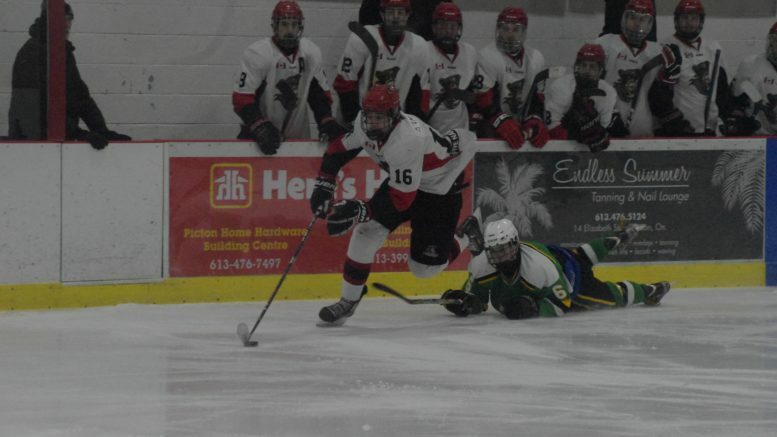 But Green knows the Tweed native is ready to go at a moment’s notice..
Picton hosts a desperate Gananoque team on Thursday and travels to Amherstview on Sunday in a contest that doesn’t mean much other than serve as a potential post season preview of the 2019 Tod Division semi finals. Picton closes out the regular season on Feb. 14 with a Valentine’s date with the Napanee Raiders.